The Steal of the Month is for all of you who want a primer which prolongs your makeup and gives you a dewy, more youthful complexion at a reasonable price. 1. To be honest, I am not the biggest fan of primers. Many of them promise a lot but don't really live up to the claims. Even if they do, most of the time you can achieve the same with the products you already own. 2. That said when I purchased this Steal of the Month I had run out of my MAC Strobe Cream and couldn't get it anywhere. I use the MAC Strobe Cream to mix in with my foundation to achieve a dewier finish. Until I could restock my beloved Strobe Cream, I just wanted to fill the gap with a cheaper substitute because I thought nothing could live up to my MAC Strobe Cream. However, the trend IT UP - Expert Illuminating Fluid & Base proved me wrong. 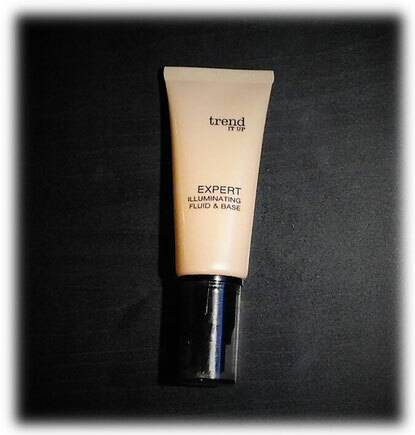 The trend IT UP - Expert Illuminating Fluid & Base comes in a tube with a pump, contains 30 ml of product at a price of just 4,45 €. The product has a slight cream-coloured tint to it. It is not too thick nor too watery and melts into my skin immediately. Now on to the product claims, according to the description, it is a skin smoothing makeup base which gives your skin a smooth, dewy and more radiant complexion. It can be used by itself or under a foundation. To cut a long story short this Expert Illuminating Fluid & Base exceeded my expectations big-time. Here is why. In contrast to much higher priced products it actually reduces expression lines leaving you with a smoother complexion. Responsible for this result is probably mainly the ingredient Gatuline. Gatuline is a botanical extract which reduces the intensity of your facial muscle contractions thereby resulting in a quick and visible reduction of your facial lines ( a kind of 'natural Botox'). This effect lasts on me the whole day. Like promised, the primer gives my skin a natural dewy finish that is great for every day. I use it under my foundation as well as mixed in this most likely enhances my results. In conclusion, I can say the trend IT UP -Expert Illuminating Fluid & Base fulfilled all product claims and performed way better than much higher priced products. Does it replace my MAC Strobe Cream? No, it doesn't. To achieve a dewy and radiant complexion, especially for special events, I prefer the MAC Strobe Cream. Nonetheless, this product is one of the best primers I have ever used, and I will keep on using it. So, for all of you who are looking for an affordable primer which smoothes your facial lines and gives you a natural glow. You should try the trend IT UP -Expert Illuminating Fluid & Base.